This session produced some of the most interesting talks of the conference, so I will go into some detail in describing them. Charlie Arntzen (ASU, Tempe, AZ) gave a typically excellent presentation on their latest work on norovirus vaccine formulation for stability and oral delivery – using lyophilized aloe gel-derived nanoparticles. Norovirus outbreaks are tracked by a CDC lab continuously; every 2 years or so new strains circulate, meaning vaccines will have to keep up. Ligocyte makes VLPs in insect cells currently; however, plant expression has been shown to be able to respond quickly to strain changes, via Icon vectors used at KBP, with the possibility of very quickly making a lot of product. Downstream formulation has been a problem, however, as the processing throws away lots of antigen protein downstream. Ligocyte use MPLA and chitosan (an irritant) for nasal immunisation: this has 50% efficacy. The FDA does not like adjuvants for nasal dosing – so they went for no adjuvant, and chose the nasal route as one gets a more uniform response for 5x less Ag than with oral administration. The formulation is basically of VLP preparations with lyophilized and milled pectin content from aloe gel: the uniformly-sized nanoparticles absorb water, and stick to each other and to the nasal mucosa for 3 hrs+. Charlie commented that “This is the one time I recommend putting white powder in your nose!”. They have tried mixing VLPs of different virus types – and found that with 50 ug of each, you get same immune response as to one. Apparently this virus is unusual as you can do virus challenge experiments quite easily: these cost $15K/patient, which is a bargain. The group is looking at annual or biannual dosing for maximum protection, and is also formulating VLPs for oral vaccination. Interestingly, the aloe gel also works for intramuscular vaccination – possibly as a result of a depot effect? Yuri Gleba (Nomad / Icon Genetics, Halle, Germany) was supposed to speak on “Technology progress in PMP (=plant-made pharma) research” – but basically said “Transient technologies are the future!”, and then went on to demonstrate it. He noted that KBP can process 1.2 tonnes biomass/day for agroinfiltrating plants, using a robot from a car factory and a converted industrial autoclave – and consequently have to grow plants in trays for infiltration. Nomad had therefore started investigating how spraying Agrobacterium onto plants might work – with a biosafe Agrobacterium as a prime requirement. They also took the bold approach of doing transient agronomic trait engineering – for traits such as flowering control, drought tolerance, yield suites, cellulases and anti-microbials – and sold the idea to Bayer Crop Science. Their technique uses an engineered Agrobacterium that is 100-1000x more efficient at gene delivery than standard strains, with surfactants that allow easy penetration of the leaf tissues. In combination with the use of replicating vectors that spread cell-to-cell, they could get 100% of standard infiltration yields, by a far easier and much more scalable technique. They found that spraying worked for most dicots and even for maize, albeit inefficiently, and that they could repeatedly dose plants for the same trait with no apparent harm. Transient expression of cry1ab and cry2ab Bt toxins delivery worked well, as did delivery of the Cold Shock protein from B subtilis, which also works for drought tolerance. Their technique does away with need for seed – they can do somatic trait addition / subtraction, they can use the technology outdoors, and there is no trait transmission and so no escape, as the genes do not get into seed. It means they can produce proteins in plants at commodity agricultural prices – which considerably broadens the scope of “biofarming” in terms of what products can viably be made!! As for antimicrobials in plants, he said organic crops have more microbes than standard, eg: the recent fatal infections caused by E coli in bean sprouts in Europe – and that a solution would be to make eg colicin E1 in the plants, to kill the bacteria in situ. One can apply for GRAS status which is MUCH faster than for other routes of approval. They were currently doing this for phage lysins, bacteriocins, and thaumatin, among others. Yuri said transient expression tech was like flash drives vs old-style PCs: a versatile set of tools vs a one-trick pony. He also mused that the technology could lead to reinvention of the old ideal of use of biofarming in undeveloped communities – presumably for low-cost remedies as well as for therapeutics, etc. To a question on what was the shelf-life of recombinant Agro he replied that there was already field use of live bacteria to combat pathogenic strains; that one can take a Petri dish and dilute in 100l water and spray, and then keep the suspension for two days…it was a very robust bug! An interesting regulatory point that came up was that the USDA thinks a plant is a GMO even if it is transiently sprayed. Andres Wigdorovitz (INTA, Buenos Aires, Argentina) spoke on their experience of a decade’s worth of work on plant-made veterinary vaccines. He opened by noting that he has a major problem of getting money from companies in Argentina – partly die to what a “product” is defined as, because what happens is that a “researcher has an egg, whereas the company wants a butterfly”. They made the decision to work in platforms – to make diagnostic kits initially, which teaches one how to make recombinant proteins. They use baculovirus/insect cells and plants – in the form of transgenic alfalfa or transplastomic tobacco – to make the same proteins for comparison purposes, and as products, depending on which was more suitable. While they had had considerable experience with FMDV vaccines made in plants, which had been protective, their current work focused on making novel vaccines and products. An example was camellid-derived VHH nanobodies – and the fact that fusing the E2 protein of Bovine viral diarrhoea virus (BVDV) with a anti-E2 VHH gave a better alfalfa-produced immunogen for something that was already protective. Their experimental vaccine was better than the commercial vaccine from the Ab response – and they could get total protection with 3 ug vaccine, and even better efficacy if they made an E2-HLA fusion. He believed they will have a commercial vaccine in less than 2 yrs as they were engaged in getting regulatory approval now. In other work, a FMDV VP1 peptide-GUS fusion expressed 10x better in transplastomic tobacco than in transgenic alfalfa. A rotavirus VP8* fusion protein was also 10x increased in chloroplasts, and dry leaves preserved the protein very well. They were also making VHH nanobodies against human rotavirus as vaccine coverage of local strains was not good – and VHH against the conserved VP6 could penetrate the outer capsid and bind and neutralize infectivity whereas larger proteins did not work. They got 3% TSP expression in tobacco chloroplasts. 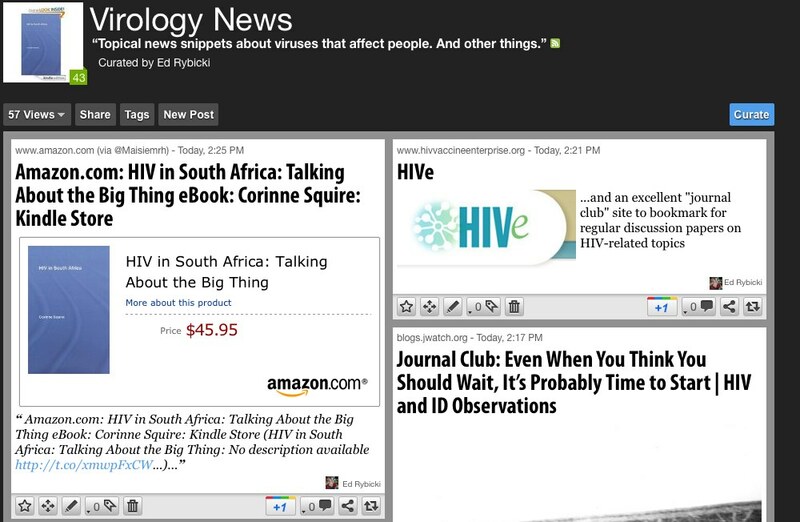 They were also making VHH to other rotavirus proteins, and to human noro- and influenza viruses. All in all, it was a very heartening demonstration of a good business model, and that developing countries too can lead the field in some respects. The remainder of the session was taken up with two talks from our group: these were given by Drs Ann Meyers and Inga Hitzeroth, on the parrot-infecting Beak and feather disease virus CP-elastin fusion protein production, and Human rotavirus CP and VLP production in N benthamiana via agroinfiltration, respectively. J Virol Methods. 2013 Jul;191(1):55-62. doi: 10.1016/j.jviromet.2013.03.028. Epub 2013 Apr 9. Expression in tobacco and purification of beak and feather disease virus capsid protein fused to elastin-like polypeptides. Duvenage L, Hitzeroth II, Meyers AE, Rybicki EP. Department of Molecular and Cell Biology, University of Cape Town, Rondebosch 7700, South Africa. Psittacine beak and feather disease, caused by beak and feather disease virus (BFDV), is a threat to endangered psittacine species. There is currently no vaccine against BFDV, which necessitates the development of safe and affordable vaccine candidates. A subunit vaccine based on BFDV capsid protein (CP), the major antigenic determinant, expressed in the inexpensive and highly scalable plant expression system could satisfy these requirements. Full-length CP and a truncated CP (ΔN40 CP) were transiently expressed in tobacco (Nicotiana benthamiana) as fusions to elastin-like polypeptide (ELP). These two proteins were fused to ELPs of different lengths in order to increase expression levels and to provide a simple means of purification. The ELP fusion proteins were purified by inverse transition cycling (ITC) and it was found that a membrane filtration-based ITC method improved the recovery of ΔN40 CP-ELP51 fusion protein relative to a centrifugation-based method. Essentially, Lucian managed in some very elegant work to show that BFDV CP fused to a 51-mer ELP allowed production and subsequent simple purification of quite high yields of fusion protein. It remains to be seen how immunogenic or protective this is – however, it is a breakthrough, as expression of the CP alone has been VERY problematic, in everything from insect cells through E coli, to plants. Current studies in the Rybicki laboratory have focused on expression of capsid proteins of a local isolate of human rotavirus (G9 P) that is not well matched to available commercial vaccines. Expression of VP2, VP4 and VP6 in N. benthamiana was targeted via co-agroinfiltration to the cytosol, endoplasmic reticulum, apoplast and chloroplast. 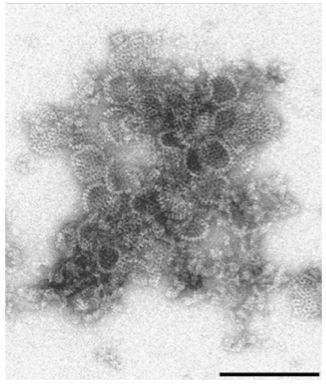 Electron microscopy showed that co-expressed VP2/6 and VP2/6/4 produced virus-like particles in the cytosol, with yields as high as 1.1 g/kg of plant material, for batches of 100 g.
This is just to announce that I will be regularly posting “Virology News” updates on a new Scoop.it site I have just set up – as well as occasionally updating another Scoop.it site – “Virology and Bioinformatics from Virology.ca” – which is curated by Chris Upton, of Univ Victoria in Canada.